http://www.alternet.org/blogs/peek/89425/ G8 Dispatches: Water Cannons, Candlelight Vigils and Rebellion in the Streets Posted by Marina Sitrin and David Solnit and Asha Colazione and Sarah Lazare, AlterNet at 11:22 AM on July 3, 2008. Citizens of the world are not invited to the G8 meetings in Tokyo, but global civil society is crashing the party. July 3 (See below for previous dispatches.) The following is a conversation with South Korean activist Dopehead Zo and the Just Words Collective -- Sarah Lazare, Marina Sitrin, David Solnit and Asha Colazione. The anti-G8 mobilizations have been bringing together inspiring organizers and activists from all over the world. Japanese precarious temp workers, calling themselves "Freeters", South Korean anti-military base organizers, Spanish media activists, Farm workers from Via Campesina, Australian human rights activists, German direct action organizers, and many others from North America, Asia, and Europe, have all come together to share stories, struggles, ideas, and to network and plan actions. At The Counter G8 International Forum in Tokyo, we met one organizer whose story is so compelling we needed to share it as soon as possible. The following is a selected transcription of our conversation. Dopehead Zo is an activist who has been heavily involved in the South Korean demonstrations against the US beef import deals. 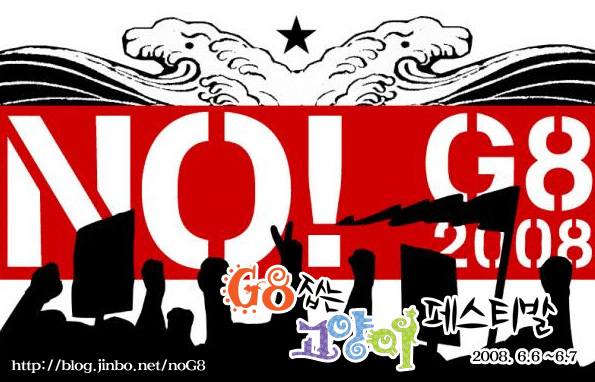 Beginning in late May 2008, mass protests have rocked Seoul and other cities in South Korea, bringing hundreds of thousands, and at times over a million protesters together into the streets. These are some of the biggest mobilizations South Korea has seen for over two decades. These are both mass demonstrations and places for the creation of new social relationships between people. As one flyer put out by activists there reads: "Candlelight Vigils Evolving to a Street Rebellion Calling for Direct Democracy - We've Got the Power" At issue is the decision taken by the new South Korean president - Lee Seok-haeng - to ease restrictions against US beef imports, most of which had been banned in 2003 after mad cow disease was discovered in the United States. The ban was a blow to the US beef industry, as South Korea was its third largest importer of US beef. Critics see the lifting of the ban as an effort to appease the United States at the expense of South Korean public health, and the trade deal has awakened broader feelings of discontent with the government's pursuit of neoliberal reforms and close relations with the United States. The overwhelming public response has virtually paralyzed Lee Seok-haeng's government and has caused him to start backpedaling on the agreement. Meanwhile, protests, rallies, and candlelight vigils continue to fill the streets of Seoul. Perhaps other forms of democracy are on the people's agenda. Dopehead Zo spoke with us for hours, sitting on the floor together after the forums of the day had finished. He shared his experience protesting in the streets of Seoul and described a new kind of social movement that is taking form. A movement comprised of, as he calls them, "common people." He describes forms of mass democracy in the streets, and the joy of being together to create new ways of relating to one another. He also explains what all of this has to do with the G8 protests and places it in the context of an overall struggle for social justice. Q: Can you describe what it is like right now on the streets of Seoul? A: People are holding candlelight vigils every night, with a minimum of 10,000 people in Seoul and several thousand in other cities. On weekends, we have 50 thousand or 100 thousand people participating. When it began, it was anti-US beef imports by the Korean government. The newly elected, right-wing neoliberal ex CEO South Korean president, wanted to give some good gifts or presents to the US. The first thing the new South Korean president did was to visit the US and beg for a good relationship, and for all kinds of things. Or go to Sarkozy. I hate to mention the president's name. The gate to the US beef industry was the imports of US beef, every part of the cow - spinal cord, intestines, heart - the parts that other people usually don't eat. I am a vegan myself, but many Koreans cook these parts and then they eat it. According to most calculations, the US beef industry would massively profit from beef imports, and once South Korea opens its markets to beef imports, other Asian countries will do the same. Talks between the two presidents took place in April, and before the talks, the two governments made an agreement and then it became known to the public in early May. As people heard more about the details of the agreement, they realized it was really unfair. Everyone could tell it was for the profit of the US beef industry, not the health of the South Korean people. If mad cow disease is in the US, there is no way to stop it with the import of US beef. The agreement was really messed up. The general public found out about it and started a candlelight vigil. South Korean people started to pressure the government by taking to the streets every night with candlelight vigils. The government didn't listen to us, of course. At first it was 2000 people then 20,000 then 100,000 ... and then more and more people ... People got angry and took to the street. Eventually the government listened to it. The pressure got bigger. The Korean government knows how to control the movement people, because the resistance or the movement has been going on for 20 or 30 years, so there is kind of a pattern as to what we do when we do rallies or demonstration. Riot police know how to respond to these situations. But this new candlelight vigil - police do not know what to do. Because when police try to stop the rally, they don't stop. They continuously move to another street. Before, back then, we had one clear target. Let's say it was the US embassy in Seoul or the police headquarters or the presidential residence. Now, people, common people, who didn't actually know about the free trade agreement before or hadn't heard of neoliberalism, like young couples with a babies, they come out into the streets with their baby in a stroller, or old people come out. So, you can see a whole new demonstrator. And there was no set pattern for when they were blocked by the police. The tactic that police used to block a road so that people cannot go in the path that they want to. In May and June, the people just started to flow, and the police realized they couldn't contain the demonstrators if they used the ways they were used to, so they brought out a new way - water cannons. We haven't seen water cannon for 5 or 10 years. Q: Water cannon against the candlelight vigils? A: Yes. Not only water cannons, but batons, shields and physical violence against people like me, with nothing - no weapons, no helmets. They also use fire extinguishers. Tear gas was kind of banned. Q: What does the fire extinguisher do? A: You use it and then demonstrators cannot breath so we have to pull back and disperse. The fire extinguisher fills the whole area instantly. We couldn't do anything on the police buses. Some of the direct action we do is that we paint a lot of graffiti on police buses or the streets. At first the police started to arrest people, and beat people, and then it got such bad media coverage because like you said, it was a nonviolent protest, and so then the police responded with civil violence and they were criticized very badly. So then the new strategy that the police started to use was to block the whole area where any protesters could go. The streets of central Seoul became neutralized every night. No traffic at all. Q: Could you describe a little bit of what it is like in the streets when there are hundreds of thousands of people, do they sing together, talk together, are they friends, what does it look like? A: We try to do everything. I am a singer myself, so I perform three or four nights a week, five or six hours each night. I get exhausted. I sleep all day and then get up again in the morning. People who have never met before talk to each other and start talking about what we should do to make our voices heard. Amazing things have been created, like huge squares or spaces. We cook, we talk, we make a speech, and when we rally, we do that kind of thing too. And we dance. Q: Can you talk a little more about the dissatisfaction with the relationship to the US and what that might have to do with the G8? A: The newly elected right wing president had a big wish. They think that the neoliberal way is the only way, and the market is their god. The president is the ex CEO of Hyundai. He thinks that a working economy means that there is construction, buildings being built. Environmental activists think this could be a disaster. It was this new administration that made the general public realize that everything is related in the name of neoliberalism... We are taking this opportunity to spread this ideology - the idea that in order to become a leader we have to receive ideas in the name of neoliberalist policies. In the name of neoliberalism, we have to open our markets. The reason we have to open our Korean markets is that if we don't do it, we will be a backwards country. That is a term that the ruling class loves to use. At first it was the US beef import issue, but then it was the government trying to impose its neoliberal policies at the same time. The president was rushing to realize his dream. The right wing loves him. These policies could affect peasants lives, or farmers lives, or small businesses. Q: Does it feel like people are talking about that, like in grocery stores or schools? A: Yes. It's very natural for Korean people to talk about the US beef issue, and once you start talking about US beef the subject becomes linked to other related issues, like opening markets through FTAs [Free Trade Agreements], like with Japan, Korea, the EU, Chile, with the US, with China and privatization, because that is the big plan for the government. The government is promising that we are going to go "forward". That's the major policy. Q: How are things organized at night? Are there political parties? Unions? How do people know where to go? A: The internet is amazing. I am really addicted to it. Internet is the main tool that we have been using. Text messages. Since the beginning, it was middle school and high school students who constituted the demonstrators, like ten thousand high school students and middle school students in their uniforms, and what they do is exchange text messages, like two thousand text messages every day to everyone: "tomorrow, 2:00, city hall square, let's go, be there with a candle." Q: The image that sometimes people have of unions or political parties taking charge is not true? The candlelight vigil started with normal people and then they realized that no matter what the people did, the government would not listen to them. And then when the crowd began to take more to the streets, that is when the labor unions got involved. KCTU [Korean Confederation of Trade Unions] is a big labor union with about 700,000 union members and university student activists. They wanted to join and then some of them wanted to become the leaders of the movement and wanted to control the flow of the actions or rallies and then the general public started to yell at the wannabe leaders - "who do you think you are to try to control our movement. It is a people's movement, not the movement of the elitist union members". It is for the common people. Every time professional activists try to regulate or suffocate the energy, the vibe, they fail. Miraculously, people succeeded in continuing their actions every day and every day. They didn't get exhausted. Why, because they have never experienced something like this. When we have marches with big unions, it is often really boring, with all of us marching in line and the same old songs being played. I play new protest songs. Those professional organizers get exhausted. They think it is not fun if you have thirty consecutive days of street demonstrations. But for these hundreds of thousands of people experiencing this, it was fun. Every day they realize something. Some of them even voted for the right wing president, when he said that he would make them all rich. But then they realized it was all lies. Then they got more angry and tried to find ways to make their voices heard. The presidential residence was protected by a high mountain and armies of police. But then people started to infiltrate those blocs and then later we succeeded in gathering in front of the residential place. We could not do anything three miles near the presidential place. Accidentally on the part of the police bloc, we opened it, then lots of people went through a small hole, and then later, we gathered. It was early in the morning. It was thirty thousand people in early June it was first a large crowd demonstration in front of presidential palace since the people's uprising in 1960. I have been long-time activist since early 1990s. Q: Does this feel different? A: For me, not really different. I have been active in the movement for a long time. I don't have any bad feelings regarding my comrades, but the way we do it is different. I am an anarchist myself, and the political movement in Korea has been influenced mostly by Marxism and the way that they organize. Q: Do you think anarchism makes more sense to people now? A: Definitely. Union leaders and organizers have been using their conventional ways of organizing and want to use them on the common people. People feel it is authoritative and don't like it. If you have someone telling you what to do, you say, we don't want that. In that sense, these are conventional movement people who think this new situation is anarchistic. We don't use the term anarchist or anarchy. I can tell the way they do it is anarchistic, but it doesn't matter, the ideology that you give yourself. The president and the whole government, they are not willing to step down or anything, and the day before I came to Japan, police brutality was really incredible. Now the government and the whole right wing have made up their mind to crush the "violent" uprising. They say it is violent because we take over the streets. The government is using scare tactics - six water cannons at the same time - it is really scary. Fire extinguishers are used and it makes it hard to breath. Participation has been smaller after June 10, the nation wide day of action, when the government started to oppress us really heavily. The ministry of education, for example, sent orders to every school that no students could participate in the candlelight vigils. Q: What are the demands of the people in the streets? A: First, renegotiation with the US about beef imports, which the Korean government denied, they said that if we renegotiate, the credit of South Korea will be hurt in the international market. Lots of trade experts pointed out that it was all lies. It would not harm the Korean government if we renegotiate with the US. That is the first demand that we are still asking. The legal process is over, and now Korean importers are inspecting the US beef. The first demand is still in effect. Second demand: the president publicly apologize or resign. Now it is becoming more and more for the resignation of the government. The whole cabinet offered to resign to the president, but the president did not accept the resignation. Q: Is there any formal organization of demonstrations? A: There is a temporary organization of organizations. The committee of all the organizations has a broadcasting truck with a big speaker, and when the rally begins, the truck plays protest music or they say something. If the police respond and approach the demonstrators, then the committee truck says something. If the common people don't like it, like if the truck says ok, we have to pull back, and then it's just gone, then the people do not leave, they just stay there. The thing is, nobody knows what's going to happen. For 30 or 40 days, the police didn't do anything and just let the people do whatever in the open space, and then people started to talk together about tactics, "do we use violence or nonviolence?" Every day, some people try to pull down police buses so that we can make our way to the presidential place. Some people yell that harming police property is a violent thing, or that repercussions from mass media will be big. Other people say police presence is violence itself so we should remove it. There are some really exciting tactics that those organizers have never thought of, like making a styrofoam mountain so that we can cross over the police buses. It is decided in open meetings, every night, in small groups and large groups. The sandbags - that was an amazing thing we witnessed one week ago - There was a huge construction site three miles away from where we were. Of course we were surrounded by police buses. We were talking about how to deal with this situation, and someone said, "ok, three miles away we have a construction site with huge piles of sand". Someone said, "how are we going to carry huge piles of sand?" We lined people next to each other from the construction site to presidential residence, then they carried sandbags, passing them from each person to each person. After three hours, we piled three huge mountains of sandbags and then we could go over the police buses. Q: Did you go over? A: No, because once you get to the roof of the police bus, they hit you with water cannons. Many people got over with their flags. Symbolic resistance. Q: What about food and water? A: It's incredible. People just pitch in money. Water, tea, coffee, sushi, kimpa, free every night. You can eat as much as you want. Street cafés open. Like one person drives a truck near the people and says this is a candlelight tea house and anyone can have cup of hot water or tea, and there is a cash jar and anyone can pitch in. For bathrooms we use nearby buildings or bathroom trucks. Q: What would be your dream scenario? A: The president steps down, and then, I don't know. I don't have a big dream. If everyone has his or her own small dream and we have our own small dreams and we can think about our way to make our dreams come true ... I don't picture a large model of society. It is created together. It is the kind of thing you can imagine through cooperation. The small group I have been working with is called blood sisters. I sew cotton pads and we sell reusable, washable menstruation pads, with organic cotton. For the last ten years, I have been working on many issues and things that I think are really important that would affect people's lives. For example, we try to get the word out about the FTA. We have been trying to spread it, we wished that people would know about it, but we couldn't - we couldn't control people's thinking. But then, after the autonomous voluntary movement, people started to figure out everything by themselves. It was really, really amazing. Somehow it was a kind of miracle. Everything we talked about came true - all of a sudden. vigil ***** July 1 Four simultaneous marches and rallies took place on July 29th in Tokyo and Sapporo, characterized by vibrant and colorful voices of resistance and a suffocating police presence. The marches in Tokyo weaved through the streets, complete with rolling sound systems blasting protest music. People chanted in various languages, waved flags from around the world, and joyfully displayed banners and puppets exclaiming what they are against as well as what they are for. Eight puppets with heads of Group of Eight (G8) leaders and bodies of skeletons moved through the crowds. Each held a yellow and red sign with a word such as hunger, global warming, poverty or privatization of resources, to indicate things the G8 is creating with its current policies. At the same time, shimmering yellow birds made of painted cardboard and satiny cloth symbolized freedom, each with a word or drawing of something demonstrators desire in the world, from clean water and air to freedom of expression to real democracy. People brought banners and flags indicating the places and groups they are from, including the CNT in France, the Freeters Union in Japan, and the Wobblies in the US. The street protests made apparent how little political breathing room the anti-G8 organizers have in which to function. Many hundreds of police flanked the demonstration route, crowding protesters into a thin line occupying less than one lane of traffic, and physically pushing those in the rear, as well as everyone who let more than a few feet of empty space grow in front of them. Hundreds more "public security" forces, a police agency in Japan that can work in an undercover political police capacity, lined the sidewalks and peppered the march, taking photographs, notes, and sometimes even setting up ladders to focus a photo on the face of an organizer. "All of these tactics are clearly part of an effort to intimidate people and limit our imaginations as to what could be possible in organizing," one participant said. "The feeling on the street is one of being constantly surveyed, and literally being pushed if you get out of line. But despite the repressive tactics, people march and sing. We refuse to allow the intimidation to silence our voices or our bodies." Repression Against Local and International Activists As the G8 meeting approaches, the Japanese government is waging an escalating battle of repression and control against Japanese and international grassroots organizations and movements. Our first indication of the level of political police repression came just after arriving in Japan last week, when we participated in an alternative media seminar in Osaka. A tall, thin man in a suit visited our laid-back guesthouse, asking to see a copy of our passports. Hostels are required to keep a photocopy of each guest's identification, but the manager declined to show them to the plainclothes police agents. They did, however, tell them how long we were staying, as required by Japanese law. Local Repression A wave of harassment and arrests of activists and organizers is taking place throughout Japan. Stories proliferate of people being arrested and held for many days under pretenses such as failure to inform the government of an address change, or alleged bicycle traffic violations. A little over two weeks ago, the police raided a day laborers' union office and arrested a well-known organizer on absurd charges--receiving social benefits several years prior without the correct paperwork. It was one of the incidents that sparked the first riots in Japan since the 1990s in Osaka's low-income day laborer neighborhood of Kamgasaki. During the riots, which spanned several nights, neighborhood day laborers and youth fought to defend their neighborhood from water-canon-wielding riot police. Four nights ago, an organizer with G8 Action Network briefed a group of international participants. He explained that they expected thousands to participate in the anti-G8 demonstration in Sapporo on the eve of the annual G8 meetings. He shared detailed stories about the excruciating amount of negotiations, permits, and government control they had to navigate to simply publicly express their opposition to the G8. Camps for participants in Sapporo had to be cancelled because police demanded to set up identity checks within the camp. Every demonstration requires a police permit. He told the internationals, many of whom are veterans of mass direct actions in Europe, Asia, North America and Australia, just how little political breathing space there was for anything remotely disobedient. As an organizer, his hands were tied by the politically controlling and repressive government. At a public forum yesterday, plainclothes police moved through the crowd taking notes. Harassment of Internationals Many foreign participants in the Counter-G8 International Forums and protests have been harassed and detained. From Hong Kong to Europe to the US, grassroots organizers and intellectuals--such as movement scholar David Graeber--have been held and interrogated for a half-day or more, and allowed to enter the country only after pressure and negotiations by the local legal team. Lisa Fithian, a United for Peace and Justice Steering Committee member and longtime labor and global justice organizer, was detained and questioned for eleven hours in what she describes as "blatant discrimination against global justice activists." She and others have been ordered to leave the country before the G8 meetings are to take place. "What is the so-called democratic government of Japan so afraid of?" she asked. The authorities told Lisa that she was held because she could not tell them exactly where she would be every day. Lecturer and policy expert Susan George was detained and questioned for six hours. Activists and organizers from Hong Kong were detained overnight, not receiving basic amenities such as food and beverages. While many of the organizers from Korea are yet to arrive, a number of those who have attempted to enter Japan have already been refused entry. We Will Not be Intimidated Each attempt to silence and intimidate local and international activists is being met with organization and resistance by the local organizers of the protests. A new generation of smart, creative, and dedicated young Japanese organizers are building networks in the face of the repression that some say may be the biggest challenge to Japan's elites since the since the militant old "new left" of the 60s and 70s. Rally ***** June 27 Like many other foreigners, we arrived in Japan holding stereotypes of Japan as a prosperous country, not one where tens of thousands of people live in the streets. Surprised by the level of visible poverty and homelessness we saw, we realized our assumptions were wrong. The next question was how to write about the issues of homelessness and displacement with relation to the policies of the G8 and international financial institutions. Last night the answer to this question appeared. Under the bright-as-day glow of bustling Shibuya Square, we had the honor of meeting organizers from Miyashita Park. Used for a wide range of activities by the community and activists during the day, Miyashita Park is home to dozens of people by night. But change is on the horizon for the park: it has been sold by the municipality to Nike. Yup, Nike. The brand name, the sneaker, the swoosh that just does it. Nike has bought the park. It is private now, no longer the domain of the people of the neighborhood. Nike is in the process of building walls to keep out the community, and of course closing it at night so it is no longer anyone's home. Privatization of parks by international corporations, causing more displacement and homelessness - thanks, Nike, for helping us make the connection. The Japanese economy is characterized by free market trade policies, an overwhelming private sector, low tax rates, and a minimal social safety net. At virtually every bump in the road over the past several decades, from the world oil crisis of 1973 to the bubble burst and economic recession of the 1990s, the Japanese government has responded with aggressive privatization measures. Safety nets for the poor and elderly have been stripped away while public goods and spaces have been sold off to large corporations. Such policies have made Japan the darling of transnational organizations like the G8, WTO, IMF, and World Bank, who claim that Japan's aggressive pursuit of neo-liberal policies have transformed it into a prosperous nation. Yet, as Japan's bare free market trade policies have increased, so too has the underclass of low-wage precarious workers, underemployed youth, and homeless people. The rise in neo-liberalism has seen a shift towards under and partial employment, especially among young people, and day laborers find it increasingly difficult to get steady work. A staggering 30,000 people live on the streets of Japan, most of whom are single, older men. Not only are they faced with precarious working conditions and diminished welfare programs, but the Japanese government works aggressively to hide them away, forcibly removing them from the parks, sidewalks, and other public spaces where they live. In addition, private developers and corporations run massive work programs which "hire" these same people who have been displaced, to work on job sites where they have to pay for every meal as well as their housing. At the end of a job, workers often have little or no money left, having spent all of it to pay for the meager living conditions they were provided. In response to these conditions, several communities of homeless people have organized amongst themselves, building tight-knit encampments where people look out for each other, share resources, and fight against government attempts at eviction. In some cases, NGOs have joined in the chorus of voices advocating for the rights of the homeless to maintain their communities. The organizers we met last night took us to the site of a government "beautification" project. They explained that over the past year, the government has been trying to "clean up" the area around Miyashita Park, commissioning art students to paint the walls beneath a nearby bridge where homeless people sleep. Of course this entailed evicting the residents of the neat row of cardboard boxes that lined the underpass. But homeless organizers fought the eviction and eventually won back their camp. As we walked under the bridge, we were struck by the orderliness of the cardboard houses, some beautifully decorated by their inhabitants with dangling chimes or painted images. One cardboard house - belonging to a homeless activist - was built out of Nike boxes, with painted yellow stars covering the black swooshes. Nike Boxes Behind these houses loomed a government-commissioned mural of the "beautification" attempt: a "cheery," flowered landscape in bright pink and blue hues. The contrast was striking: this was a war of appearances, a struggle over who gets to define the beauty and function of a space. The G8 protests are fundamentally about how public goods and spaces are used, and who gets to decide. Should land, water, and public space simply be sold off to the highest bidder, or should communities have control over the decisions that affect their lives? Last night, while we were meeting with the activists who showed us around the homeless encampment, one organizer wrote "No G8" in English and Japanese on a piece of paper. We all looked at it and one woman asked, "What do we want instead of a G8?" After a bit of discussion, the young man pulled out a new piece of paper, and in English and Japanese, wrote: "We are the real G8." Then he changed it to "We are the real G-8 billion." Then, after thinking about it for a few moments longer, he crossed that out and changed it to "We are the real G-infinity." Realg8 ***** June 25 We are four friends who just flew across the world for a meeting we were not invited to. Why would we feel compelled to do such a thing? It is exactly because we were not invited to the 2008 Group of Eight (G8) Summit that we feel we must go. The G8 meetings bring together world superpowers once a year to set global economic, environmental, and political policies. You are invited to this meeting if you are the leader of a rich, powerful country interested in colluding with other governments to consolidate the power of the global wealthy elite. You are not invited if you are a citizen of the world, from either a "rich" or "poor" country, who is interested in building communities based on mutual aid, human needs, and respect for the environment. We think this is a recipe for an unjust world, and we plan to crash their party. The G8 meetings were conceived in the early 1970s in response to a burgeoning economic recession. Initially just the G6 (consisting of six member states) the meetings brought together world superpowers to talk about how to respond to the crisis and establish economic security for themselves. The summit eventually expanded to include a total of eight member states - the UK, US, France, Russia, Germany, Japan, Italy, Canada, plus the president of the EU, and today the G8 presents itself as a forum for establishing world economic stability and tackling global problems, such as climate change, hunger, and disease, and poverty. When the richest, most powerful leaders of the world come together, is it really to talk about how to help the poor? And why is it that after every annual meeting, all they ever seem to accomplish is further consolidation of their power and securing of their economic advantage? In reality, the G8 meetings have been a part of a general trend towards international neo-liberal economic policies that privilege corporate interests at the expense of the world's poor. The policies instituted by G8 member states do the exact opposite of the G8's stated "humanitarian" goals; they give "aid packages" that trap the poorest countries into debt while removing social programs. They wage wars and commit military atrocities, from the invasion or Iraq to the funding of Israeli bombers. They maintain the oil and coal-based energy systems that cause climate change. And they perpetuate corporate power at the expense of direct democracy. But there is another story simultaneously being told--one of resistance, alternative organizing, and people coming together to create a more just society. In response to the G8, as well as other transnational institutions that generate neo-liberal policies, a global resistance movement has blossomed. From Italy to Calgary, Switzerland to Japan, people have come together to try and prevent the G8 from making any more decisions that will adversely affect people's lives. In the most recent meeting of the G8 in Germany, global activists physically blockaded the G8 meeting entrances and set up eco-camps outside of the summit, where they sought to model alternative social structures by providing earth-friendly food and housing for international activists. Even on our first day of Japan, the area of Kamagasaki in Osaka was witnessing a riot, one of many in the past years, in response to the precariousness of work and survival. All over Japan, homelessness and poverty has been on the increase, especially over the last ten years as the Japanese government has imposed neo-liberal market policies and privatization measures on its population. Just as there has been a rise in homelessness and poverty, there has been a rise in resistance. From the organization of precarious workers to homeless encampments to the expansion of alternative media, people in Japan are fighting back. The G8 summit is undemocratic at its core, setting policies that affect the world, while denying the input of most of the global population. But alongside the G8 meetings will be a powerful counter-summit, where a diverse gathering of people from around the world will come together to discuss alternatives to this system of hierarchical power and greed. The four of us, the Just Words Collective, will be sending out regular accounts of our experiences in Japan, including interviews with social justice organizers, reports on the anti-G8 actions, and pieces of the discussions on how we might work together to build a better world. Digg! Tagged as: g8, japan The Just Words Collective is a group of four friends who are engaged in various global justice struggles and believe in the power of words and action to change the world. Very good that you put out this statement below. I think if you put this into a press release format, with press contact there (both email and phone), then we could likely translate to German and send out here. German press is still quite interested in G8. However, I suggest writing in slightly more "professional" way for press, such as citing/quoting Japanese laws they are breaking, or maybe international law. 6월 말부터 7월 1일까지 도쿄에 있는 동안에는 신주큐에 있는 이레귤러 리듬 어사일럼(IRA) 로 연락하면 G8을 반대하는 사람들과 연락이 닿을 수 있습니다. 직접 찾아오시거나 전화를 걸어도 되고요. adreson : 1-3-13 Asabu, Kitaku, Sapporo, JP001-0045. 6월 10일 백만이 모인다고 합니다. 우리 G8을 반대하는 사람들도 6.10에 무슨 액션을 하면 좋을까요? 먼저 만나서 같이 고민해보고, 나름 준비도 해봤으면 좋겠어요. 6월 10일 화요일 오후쯤에 미리 피자매 사무실 같은 곳에서 모여볼까요? 답글 달아주세요. 뭔가 재밌는 계획들이 나올 것도 같아요. 하긴 일하는 사람들은 오후에 모이기 힘들겠구나. 전 화요일 밤 10시 이후에나 나갈 수 있겠어요. 같이 준비하는건 힘들겠고, 뭔가를 하고 있으면 갈께요..
전력문제에 문제가 있기에 보강을 해서 준비를 하려고 합니다. 위치 선정이 중요하기에 좀 서둘르려고 합니다. 폰으로 함께 할 사람들 모으는 작업도 해 주시길..
그러면 한 9시 정도에 모두 광화문 부근에, 좋은 장소를 잡은 다음, 모이면 되겠네요. 내일은 유동적인 상황이 벌어질 것 같으니까 저는 미리 6시 이후부터 촛불집회에 나가서 좋은 자리를 찾아보도록 하겠습니다. 오후에 따로 모일 필요는 없겠고, 시간이 나는 사람은 7시 촛불집회부터 하고, G8 캠페인은 오후 9시 무렵부터 시작하는 것으로 하고 세부적인 사항은 내일 상황에 따라 유동적으로 대처하는 것으로 해요. 어제 올리려 했는데 넘 늦게 들어가서 이제서야 올리네요. 오늘 쥐 에-잇 잡는 고양이 페스티발 마지막 날 입니다. 어제와 달리 더 많은 사람들이 참여하고 만듭니다. 이날 길학교에서 단체로 관람을 오셌다. G8관련 모든것을 영상 프리젠테션으로 알리고,, 왜 쥐 에잇을 반대하는지 !! 고양이 페스티발 첫째날에 오신 모든 분들께 감사드립니다. 오늘의 멋진 공연은 6월 7일 내일도 계속됩니다. 오늘 오지 못한 분들은 아래 사진을 보시고, 내일 오후 5시부터 둘째날이자 마지막 공연이 펼쳐지지 서울 영등포에 있는 하자센터에 오세요. 고양이 모양으로 만든 쿠키. 예쁜 만큼 맛도 좋아요! 맨날 쥐잡기 쥐잡기 했는데, 사실 쥐들에게 미안했어요. 우리가 미워하는 것은 쥐들이 아니라 이명박 정권과 G8이지요? 손수건에다 멋진 고양이 모양과 No G8도 스텐실로 그려넣었습니다. 음향부터 행사 전체를 조율하느라 수고한 꼬미와 그 앞에서 폼을 잡는 멋진 박하. 고양이 페스티발이 열린 하자센터 2층 곳곳에 우리들이 붙여놓은 행사 안내문과 설명 그리고 구호들. 자세히 보면 인디스페이스에서 개봉한 다큐 '필승 Ver 2.0 연영석' 안내장도 볼 수 있다. 개막 공연으로 멋진 퍼포먼스를 보여준 솔문. 지금 우리의 흔들리고 불안한 삶을 보여주고 있는 것 같다. 우리는 삶의 중심을 잡으려 비틀거리지만 자꾸 미끄러지기도 하죠. 한창 바쁜 나날을 보내다 목에 염증이 생긴 와중에서도 역시 연영석이라는 감탄사가 나오게 만든 문화노동자 연영석. 언제나 가슴 깊이 잔잔한 울림을 전하는 별음자리표. 루드의 상상력에서 기타를 치는 쏭. 어제도 광화문에서 새벽 3시까지 멍구와 함께 흥겨운 길거리 공연을 했음. 길바닥평화행동에서 만난 사람들이 임시로 결성한 고양이들. 온앤오프 무용단. 언제나처럼 격정적이면서 열정적인 무용으로 관객과 하나가 됩니다. 만남과 헤어짐. 그리고 다시 만남. 우리의 삶이 아름다운 몸짓으로 다시 태어나는 것 같아요. 경계를 초월한 평화의 메시지를 힙합 비트에 담아 실어나르는 실버라이닝의 미스터 박하! 그와 함께 관객들은 일어나 춤을 추기 시작한다. 실버라이닝의 팽이. 예전과 하나도 바뀐 것이 없는 지금의 교육제도 하에서 학생들은 서로 경쟁하는 법만을 배운다. 교실에서 죽어가는 아이들을 노래한 명곡 The Wall을 부르고 있다. 요즘 그야말로 고양이들의 기세가 하늘을 찌를 것 같습니다. 쥐를 잡는데는 역시 고양이가 제일이지요? 전국 각지에서 쥐를 잡겠다고 나선 분노한 고양이들이 연일 밤새 길거리를 장악하고 있습니다. 이명박을 비롯해 전 세계 선진 8개국에서 시민들의 안녕과 건강을 노리는 쥐8을 이번 기회에 완전히 잡아버립시다. 6월에도 고양이들의 길거리 행동은 계속됩니다. 회의 때 누가 정리해서 올릴 것인지 미처 정하지 못했네요. 저도 적지 못해서 누가 다른 사람이 대충 정리해서 올려주면 좋을 것 같아요.